The next day considerable precipitation fell but not rain. Six inches of snow in the city, twelve inches up in the mountains. Obviously weather forecasting isn’t an exact science. Despite all the data gathered, there could be a tiny bug in the system that throws off the prediction. The chaos butterfly. An analogy that shows how an unknown element or X factor can make the weatherman look like an idiot. Two months before the weatherman predicted rain, a butterfly in China flapped its wings a couple of extra times. This pushed additional air molecules along, a small action that kept building as the days passed, until it turned into a cold air mass that unexpectedly shifted, turning rain into snow. But UFO sightings and other strange events still happen. Yes, some can be explained as delusion, misidentification, fraud, whatever. But a few puzzling cases remain that can’t be conveniently swept under the scientific carpet. If there’s the chaos butterfly, why not something analogous on a metaphysical level? Why not the chaos purple elephant? It exists outside of quotidian experience but sometimes it stumbles, protruding into our sphere of reality. Normalcy twists; weird stuff happens. But soon the chaos purple elephant is forced back into its own dimension. Maybe the para-dimensional pachyderm sticks its trunk under the tent of perception. An UFO is seen. Or its foot stomps in to make an impression. A cyptoid is glimpsed. Or its tail brushes against the membrane of our existence. Ghosts pop into view. After these seemingly unrelated events, three blind experts come along. The first makes his conclusion based upon the trunk incident. The second, the foot. The third, the tail. All three are wrong because each explanation is only based on part of the paranormal whole. Of course, the blindest of the blind are the dogmatic skeptics. Trunk, foot, and tail – all nonsense to them, nothing extraordinary to be seen here, move along. Maybe someday they’ll have to shovel up after the chaos purple elephant. Until then, the circus goes on. 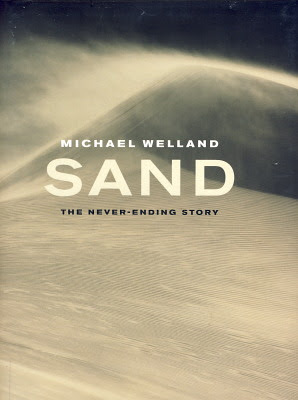 A nonfiction book about sand? Sand: The Never Ending Story proves that there is indeed a world of knowledge in a grain of the stuff. The author, Michael Welland, covers the topic not only on this world but beyond, to Mars and one of Saturn’s moons, Titan. But what intrigued me the most was geological forensics, how the properties of a particular sand can be used to determine its origin point, valuable evidence in a criminal investigation. One case involved $3 million worth of gold that turned up missing while being shipped. It was discovered after opening the crates that ordinary sand and iron bars had been switched with the gold. It was suspected that the substitution had been made in Canada but a forensic geologist and policeman determined that the sand originated in another country. Another example of sand forensics involved a pickup truck driven by the murderer. Mud splashed on the truck contained tiny debris from a quarry. This debris washed downstream in a river, diluting as it traveled along, blending in with other sand and mud. When the river was low the quarry sand would end up in sandbanks along the rivers’ edge. Sandbanks further downstream had fewer of the distinctive grains; each location had its own mixture. Sand from the crime scene matched what was found on the pickup. Welland also mentions that during World War II that balloons carrying incendiary bombs were falling on the United States (the fugo balloons which I posted about before). From where were they being launched? The balloons used ballast bags filled with sand to maintain height as part of an automatic altitude regulation system. Hydrogen or sand would be released as the balloon drifted towards the US. The US Geological Survey’s Military Geology Unit was called in to ID the origin point of the sand. Using prewar geological reports the granular investigators were able to determine two locations on the east coast of Japan. Air photographs helped to target hydrogen factories at those sites for destruction.